New Unsubscribe - Triggers when a someone unsubscribes from a list. New List - Triggers when a list is added for a client. New Bounce - Triggers when an campaign email to someone bounces (ie. could not be delivered). New Subscriber - Triggers when a new subscriber is added to a list. 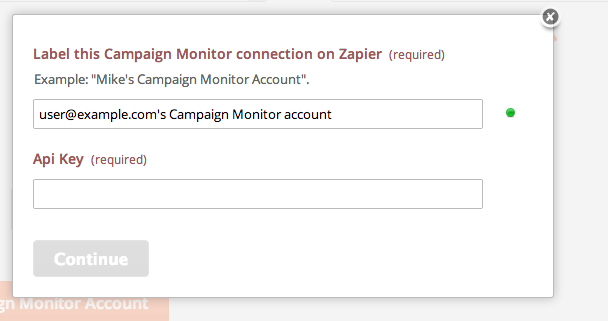 New Client - Triggers when a client is added to Campaign Monitor. New Email Open - Triggers when someone opens an email from one of your Campaigns. New Click Through - Triggers when someone clicks through an email from one of your Campaigns. New Bounced Transactional Message - Triggers when a transactional message bounces. Add Subscriber - Create a new subscriber on a list. Send Smart Transactional Email - Sends a smart transactional email. Unsubscribe - Remove a subscriber from a list. Update Subscriber - Update a subscriber on a list. Find Subscriber - Find a subscriber by email within a given list. Only sent campaigns can be selected. Draft campaigns won't appear in the dropdown until they are sent to at least one recipient. If the error message authorization failed: api.createsend.com returned (401) Unauthorized and said "Must supply a valid HTTP Basic Authorization header" is showing when trying to connect a Campaign Monitor account, it's possible the wrong key may be getting used. In Campaign Monitor's "Manage API keys" settings, note that the API Key needed requires clicking "Show API key" first. Using the "Client ID" leads to this error.